The NHS is an excellent organisation set up in 1948 with the central principles that the Health Service will be available to all and financed entirely from taxation ensuring people pay into it according to their means. There are increasing pressures on the NHS in 2018 with health care professionals being stretched to their limits due to financial and other challenges and yet still delivering an excellent service . VISUALNUMBERS has worked with a number of clients in the 'Category C branded generic' and 'Specials' medicines areas where significant cost savings can be made by General Practitioners prescribing the least expensive BRAND of medicine. One such client of VISUALNUMBERS, previously saved the NHS in excess of £160m over 7 years by making available 'Category C branded generic' medicines at up to 56% less than the Category C drug tariff price. guarantee that they won't increase their prices. Costsavings4NHS is a 'not for profit' organisation that VISUALNUMBERS is looking to set up to help celebrate those CCGs who are making the best cost savings in 'Category C branded generic' and 'Specials' medicines areas. Also, we will be looking to identify opportunities for maximising savings through working with medical professionals to reduce medicines wastage with improved patient compliance. Costsavings4NHS will be funded through donations from organisations that have no interest in any current medicines, directly or indirectly. Please see below examples of the work that we plan to release on a separate costsavings4NHS.org website once this 'not for profit' organisation is fully established. 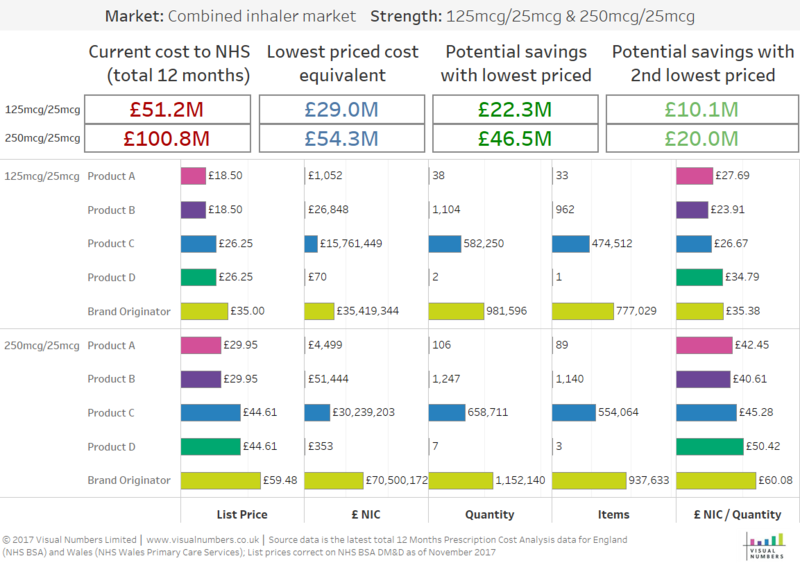 In these examples we have looked at a specific inhaler market with two strengths of inhaler where prescribing by the least expensive brand could potentially save England and Wales almost £70m per annum. In this market the Brand Originator inhaler (ie the inhaler which is now off patent) sets the Category C drug tariff reimbursement price. So if any prescriptions for the brand originator product or the generic equivalent are written then the price to the NHS is £35 for the 125mcg/25mcg inhaler and £59.48 for the 250mcg/25mcg inhaler. If prescriptions are written by Product A or Product B in this market then there is the potential to save c£70m per annum across England and Wales. 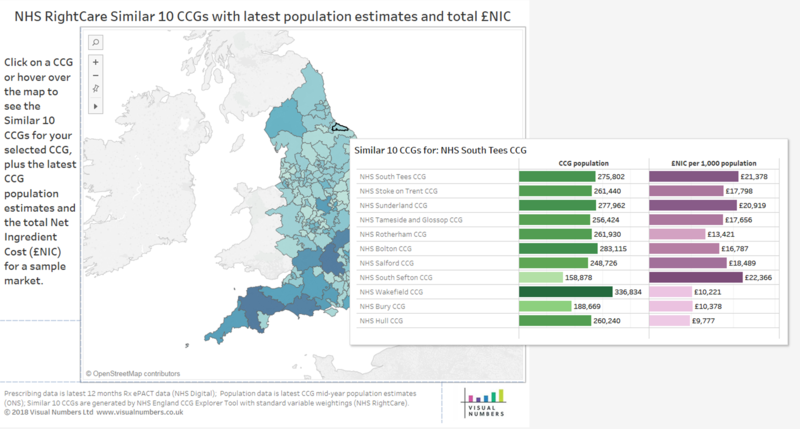 This interactive map shows the Similar 10 CCGs for the specific CCG you have selected, based on the NHS England CCG Explorer Tool with standard variable weightings (NHS RightCare), and shows the corresponding latest mid-year population estimates for each CCG (ONS) and the £NIC for an example market. View this report in our Tableau Public Gallery. 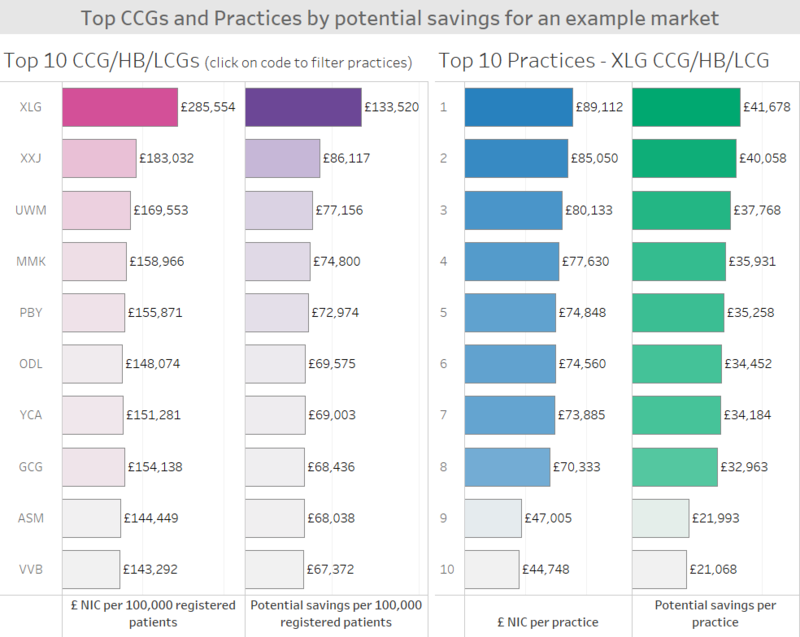 In this interactive example, we have anonymised the CCGs with a 3 letter code and shown the Net Ingredient Cost (£NIC) for a medicine group along with the potential savings per CCG. Additionally when you click on a CCG on the left hand side of the visual then the top 10 GP practices change on the right hand side of the visual. View this report in our Tableau Public Gallery.